(ARCADIA, CALIFORNIA, USA) – Heir Kitty overtook 4-5 favorite Sweet Lulu in the final furlong to post a 13-1 upset in the $300,000 La Brea Stakes (gr. I) on opening day at Santa Anita Park Dec. 26, giving Hall of Fame jockey Gary Stevens his first win in the race since 1998. The 50-year-old Stevens, who launched a comeback early in 2013 following a seven-year retirement, won the La Brea for the fifth time in his career. His first La Brea victory came in 1987 with Family Style for trainer D. Wayne Lukas. Peter Miller trains Heir Kitty, a daughter of Wildcat Heir owned by David A. Bernsen and Paul Makin. 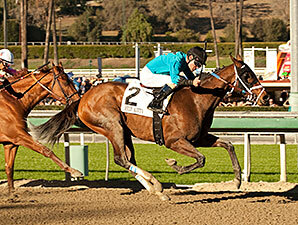 Heir Kitty, multiple graded stakes-placed, earned her first graded triumph. Heir Kitty won as the second-longest shot on the board, defeating Sweet Lulu by 1 1/4 lengths in 1:21.47 for seven furlongs. Executiveprivilege edged My Happy Face for third in the field of six 3-year-old fillies. The La Brea was the first graded stakes of the extended 109-day meet in 2013-14 at Santa Anita. A $32,000 Ocala Breeders’ Sales Company purchase in April 2012, Heir Kitty was bred in Florida by Pedro Gonzales and Jorge Herrera out of the stakes-placed Silver Buck mare Be Silver. Heir Kitty was coming off a victory over an allowance/optional claiming field at six furlongs on the Cushion Track at Betfair Hollywood Park Nov. 29. She found a good stalking spot along the inside leaving the chute with My Happy Face to her outside. Sweet Lulu, breaking from the rail, hustled to the front under Rafael Bejarano over Journey On, who led out of the gate. Those two raced in close contention with Sweet Lulu, exiting a fifth-place finish in the Breeders’ Cup Filly & Mare Sprint (gr. I), holding a half-length advantage after sensible quarter-mile fractions of :22.67 and :45.45. Heir Kitty, racing about 1 1/2 lengths behind the leaders coming off the turn, was up on the outside in the lane, drawing even with Sweet Lulu mid-stretch and gradually getting control for Stevens in the final sixteenth of a mile. “I rode this race a bit like a turf race,” Stevens said. “I was able to sit back in the pocket; this dirt is in unbelievable condition. We aren’t getting near the kick-back we were getting during Breeders’ Cup and the fall meet. Sweet Lulu was 2 1/2 lengths in front of Executiveprivilege and Mike Smith, who finished a head better than My Happy Face. Journey On and Madame Cactus trailed. Heir Kitty, who ran second to males as a 2-year-old in the Best Pal Stakes (gr. II) at Del Mar and was also second in Santa Anita’s Santa Ysabel Stakes (gr. III) last January, improved her career mark to 4-3-1 in 15 races with earnings of $370,272. The winner carried 118 pounds, five fewer than the highweighted favorite, and paid $28.20, $7.60, and $4, while keying a $65 exacta. Sweet Lulu, winner of the Test Stakes (gr. I) at Saratoga Race Course last summer for trainer Jerry Hollendorfer, returned $2.80 and $2.40. Executiveprivilege, who added blinkers for trainer Bob Baffert, paid $3.40 to show.